Nowadays, there are varieties of mixer grinder available to ease your task. At the same time with the availability of so many types of mixer grinder in the market, it becomes really confusing to choose the best mixer grinder. Usually, a Mixer grinder comes with two kinds of jar. 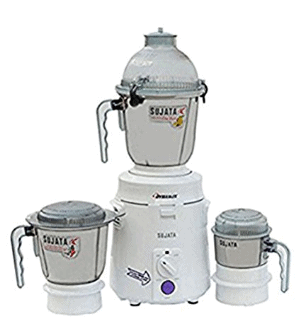 Grinding jar and Chutney jar that help you with mixing and grinding process but these days, most mixers come up with Juicer jar which is very useful. Since the basic component is same in mixer and juicer which is rotating the motor, many people prefer to go with juicer jar mixer grinder if it’s available along with it. Based on the above selection criteria, the following are our recommendations for the best five mixer grinders in India. 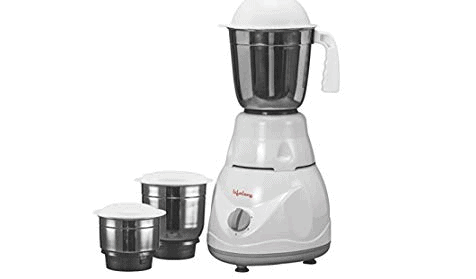 Bajaj Rex mixer grinder comes with three jars, a 1.2L Liquidizing jar, a 0.8L dry grinding jar and a 0.3L chutney jar. Chutney jar allows you to make a blend of masalas and paste. Liquidizing jar helps you in blending and liquidizing operation to make fruit or milkshake and Lassi. Its 800 ml grinding jar allows you to do the wet or dry grinding. This mixer grinder volume is sufficient for a family of 3-4 members. Its jar lid contains rubber mounting in the inner side which helps in the airtight closure of jar and it won’t let the material spill out in the grinding process. Each of jar comes up with easy grip handle and is of stainless steel so is having a long life. Bajaj Rex 500-watt mixer grinder comes up with 3-speed control that allows you to set motor speed as per the grinding and mixing material so as to have a momentary smooth operation. Note: During initial usage, it may smell when you will switch it on. This is because of motor varnish getting heated for the 1st time. It should go away after 2-3 usage but if it doesn’t contact brand customer care on 18001025963. The Philips HL 7720 mixer grinder is not only sturdy but also delivers impeccable performance. It is powered by 750 watts specifically designed motor which gives great performance for all kinds of food ingredients. Its innovative design prevents motor damage due to prolonged use. The Motor of the Grinder shuts off automatically in cases like overloading, excess heating and imbalanced voltage etc. 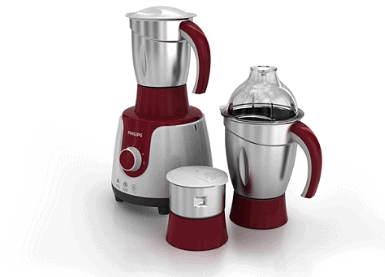 Philips HL 7720 750-Watt Mixer Grinder comes with three versatile jars fitted with super sharp blades to facilitate mixed grinding, dry grinding and wet grinding. The 0.4L jar grinds the chutney, the 1.5L grinding jar is used to grind the wet ingredients and the 1L jar is a dry grinding jar. Each of the jars and mixer is made of stainless steel thus giving it a sturdy frame. It has 3 lock speed regulator in the front which aids in setting the speed required. So you can grind at any speed as per your requirement. The grinding jar of Philips HL 7720 750-Watt Mixer Grinder is having easy grip handle which facilitates easy mounting and dismounting the jars. Sujata DynaMix is a versatile all-purpose mixer grinder that will help you quickly prepare your favourite dishes in the best manner. This mixer grinder comes with 900-watt powerful motor which not only saves your time in mixing and grinding process but also you will rarely have the occasion to use more than the low-speed setting to get the best results. Sujata DynaMix comes with 3 jars. A big jar with a dome-shaped lid for wet grinding, 2 separate stainless steel jars for dry grinding and chutney grinding. Mixing, grinding, crashing is faster and up to the expectation. Although the motor is very powerful but compared to other 750 watt and 500-watt mixer grinders it produces minimal sound. Sujata DynaMix mixer grinder design is elegant, compact and has fine finishing thus suiting to the modern look of your kitchen. All the three jars are stainless steel jars and are easily available as spare if required. From making Indian masalas to preparing Idli batter and dry spices, this grinder set can make your job easier in the kitchen. Powered by a heavy-duty motor this kitchen appliance is safe and for long lasting usage. It has a shockproof body that is safe to use every day. Plus the jars and the blades are made of stainless steel for durability. Prestige Iris Mixer Grinder is your most versatile partner in the kitchen. It comes up with 3 stainless steel jars and transparent juicer jar which takes care of your entire mixing, grinding and juicing task. Prestige Iris Mixer Grinder comes with a powerful 750-watt motor. It is designed to make every task quick and easy thus serving very effective for your day to day kitchen job. Fast speed (20000 rpm) of the motor makes your blending and grinding job quick and also give solid ingredients to a smooth texture. 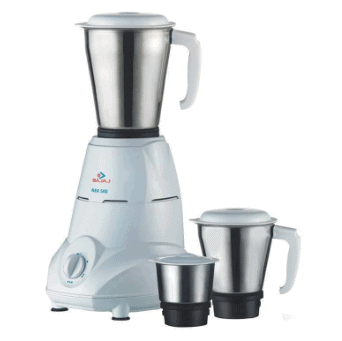 Prestige Iris Mixer Grinder comes with 4 jars. Liquidizing jar, dry grinding jar, chutney jar and juice jar. Each of the Liquidizing jar, dry grinding jar, chutney jar is a stainless steel jar which makes it rust free for long usage while juice jar is of transparent glass. These jars are convenient to use and you can easily wash it or simply can wipe it. The grinding and liquidizing jar serves various purposes. Starting from grinding solid ingredients to blending fruits, it allows you to perfectly blend everything. It comes up with three-speed control point which you can adjust according to the material. Its jar handles and lid are plastic made which perfectly fits into your grip and prevents slippage. The lid of the jars comes up with a rubber grip that makes the lid highly durable also prevents any extra sound. The Lifelong power Pro mixer grinder with 500-watt motor is a solid durable kitchen appliance for your everyday kitchen use. It comes up with 3 jars, 1.25L Liquidizing jar, 0.8L dry or wet grinding jar and 0.5L chutney jar. Each of the jars is made up of stainless steel and is extra thick, which along with giving it added strength also prevents rusting. Jars have a unique feature of flow breaker which results in fast and effective grinding. Its unique blade alignment at the bottom of jars grinds all of the ingredients to a smooth paste or powder. Lifelong power Pro grinder gives you superior juicing, mixing and grinding performance with convenience. The machine comes with 3 hard-stainless steel blades. You can use the three different blades interchangeably as per the nature or requirement of the ingredient being cooked. Lifelong mixer and grinder comes with a 3-speed setting that allows blending and grinding to be as easy as possible which allows you to gradually increase/decrease the speed without overloading the machine. If you are having a big family especially more than 5-6 members then you should go with Sujata Dynamix which has high powered motor and durable good capacity jars to meet all your needs. 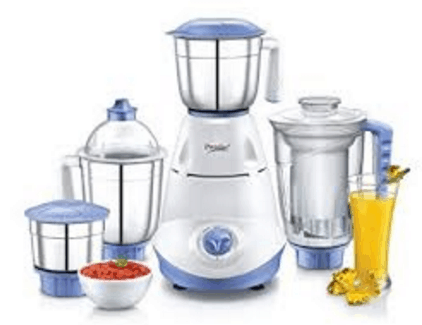 Bajaj Rex 500-watt mixer grinder and Lifelong Power Pro mixer grinder is very well suited for small and medium-size family needs. Lifelong mixer grinder is a most budget-friendly mixer that you can get. You can go for prestige which has additional juice jar that allows you to do juicing in addition to mixing and grinding.